Oh Christmas bean, oh Christmas bean, how green you are before roasting; Oh Christmas bean, oh Christmas bean, once brewed, you are worth toasting! Hey, everyone, welcome to the…. It’s that time again to pay homage to the liquid gold that fuels us all year through, and especially at this time of the year! 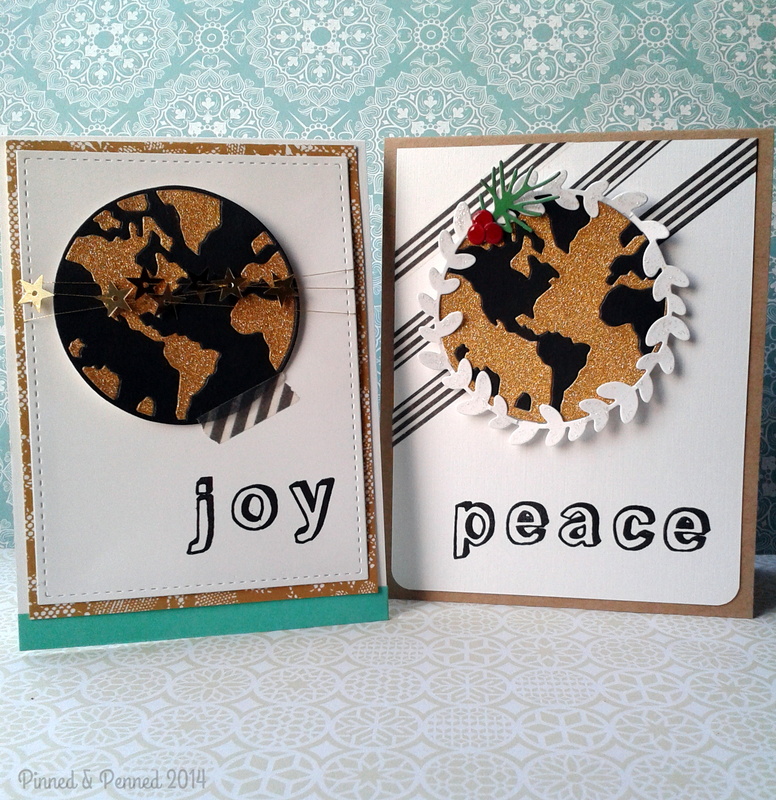 Each hop more and more coffee loving papercrafters come aboard, and it’s always so much fun to meet new participants, and reunite with others at this quarterly event. This time around there are 49 sponsors and prizes to be won! Those super commenters have their work cut out for them, as there are already over 500 entries and two days left! 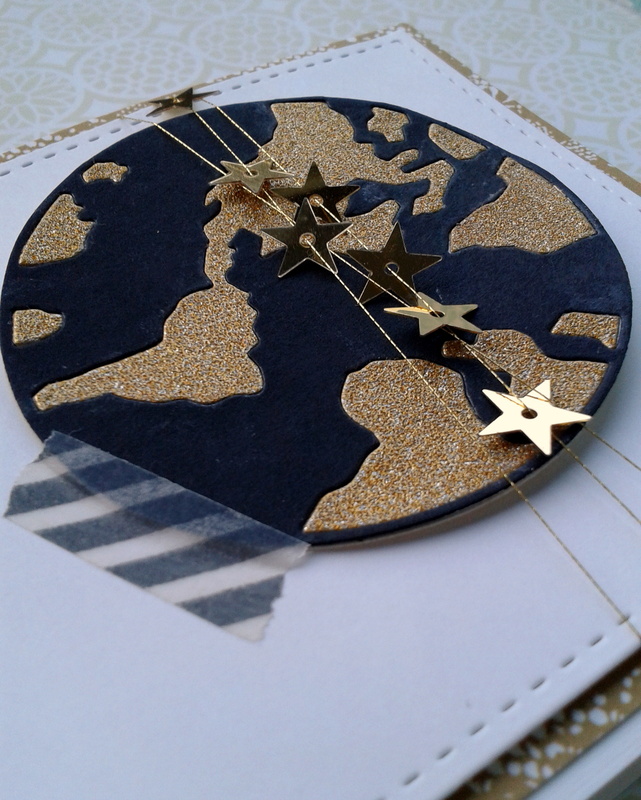 Amy and Chaitali have created a tsunami of an event, and the number of coffee stamps, dies, and embellishments that have followed in their wake is staggering! I have required copious cups of coffee this past month, not because it is the holiday season, but because we are raising a new kitten and dealing with everything that goes along with that (kitten-proofing the house, dealing with “Utinni oops” on linens, poopy paws and runny noses, vet visits, cleaning, cleaning, laudromat, cleaning, repeat and repeat and repeat, and managing existing cat dynamics). Luckily, I teach out of my home studio, so disasters have been apprehended early, and I can easily monitor events. She is starting to jump higher and higher, and scaled my shower curtain just tonight…the fun is only beginning! Here’s our little dirty snowball with icicle eyes– a perfect Christmas kitten–Utinni! But really, I am as sweet as an angel! Leo is such a good big brother! He has defied my expectations! If you are wondering about her name, she is named for a word in the language of the Jawas in Star Wars (anyone heading to theaters tomorrow or this weekend?) but it is merely a coincidence that the movie is coming out just after her adoption. We actually named her last spring on a trip to Portland before we even knew her. Full name is Utinni Alberta Noi (the last two being favorite places in PDX) and it’s just so fun to say! I love Courier Coffee in Portland! So back on track (kittens have a tendency to derail you every waking moment), and on with my card, that could also function as a tag! 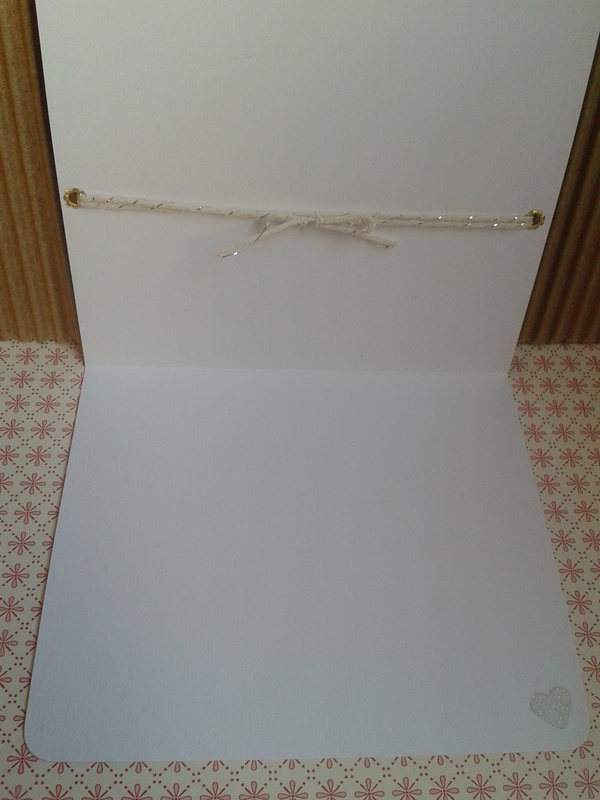 I have left it open to be either adhered to a card base or just clipped onto some gifted beans. And talking about beans!! I Distress-inked some watercolor paper with Pine Needle ink (love that color!!) and set out to cut many, many beans from the Impression Obsession coffee set. These dies have made an appearance in a variety of my prior coffee hop entries, which you can see here. If you didn’t know already, coffee beans are actually green before roasting! I adhered beans to a base, fussy cut, and then used some icicle Stickles to add sparkle, and finally adorned the tree with Memory Box’s Festive Lights die. 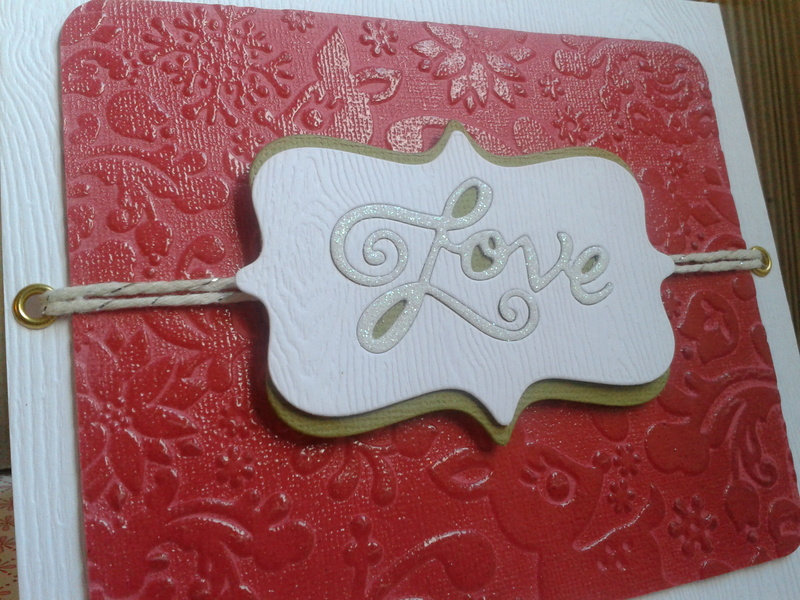 Using my favorite embossing plate from PTI, I added texture to the background card cut from a Lawn Fawn notecard die. I instantly fell in love with Basic Grey’s Juniper Berry line this year, rivaled only by Pinkfresh’s holiday papers, so Juniper Berry will be featured in many of my holiday cards. Here I have used the geometric woodgrain and the hot-pink design. To add to the scrappy aesthetic, I rummaged around for some fun embellishments such as this acetate Maggie Holmes leaf, Freckled Fawn metal wreath, and sentiment, created with my new, awesome, Stampin’ Up Rotary stamp– the largest rotary stamp ever. You can order one here from my girl Tonya!! 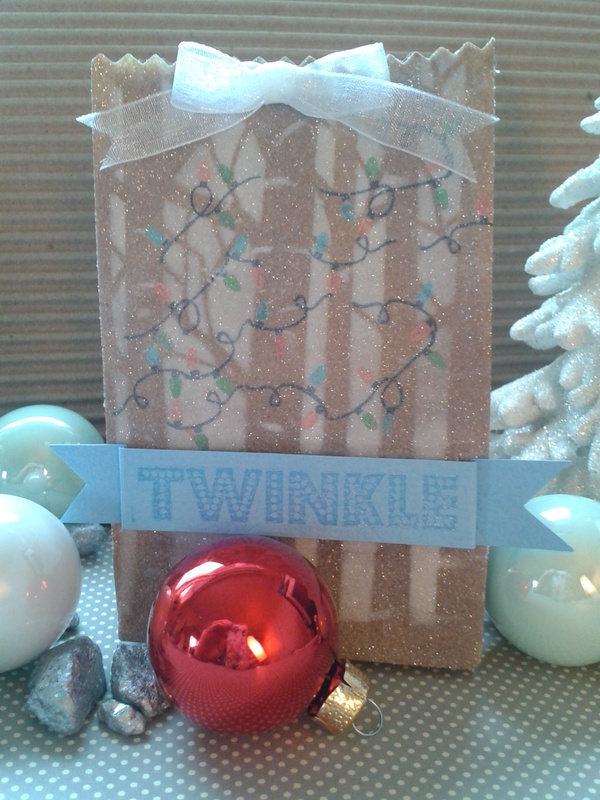 And check out her beautiful cards while you are at her site!! 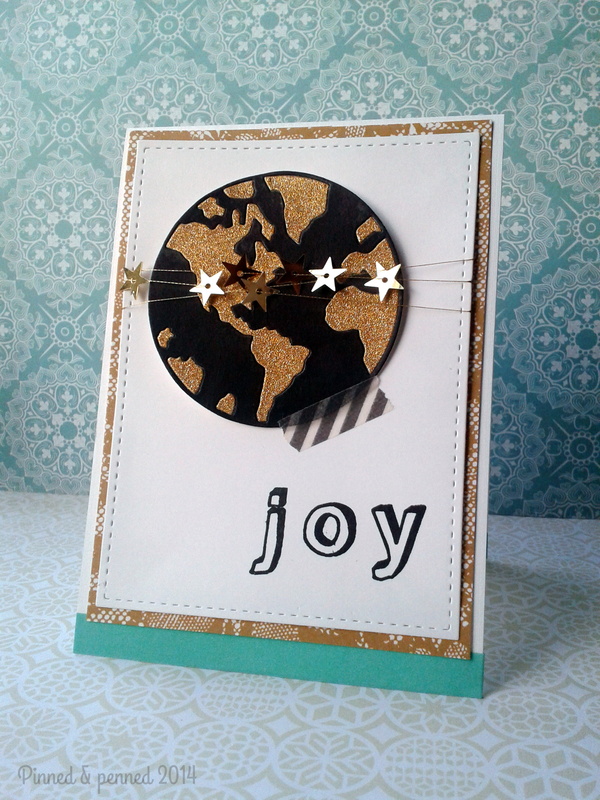 I clipped everything to a woodgrain paper base from Ellen Hutson, added a strip of silver/teal washi, and placed a star on the highest bough! 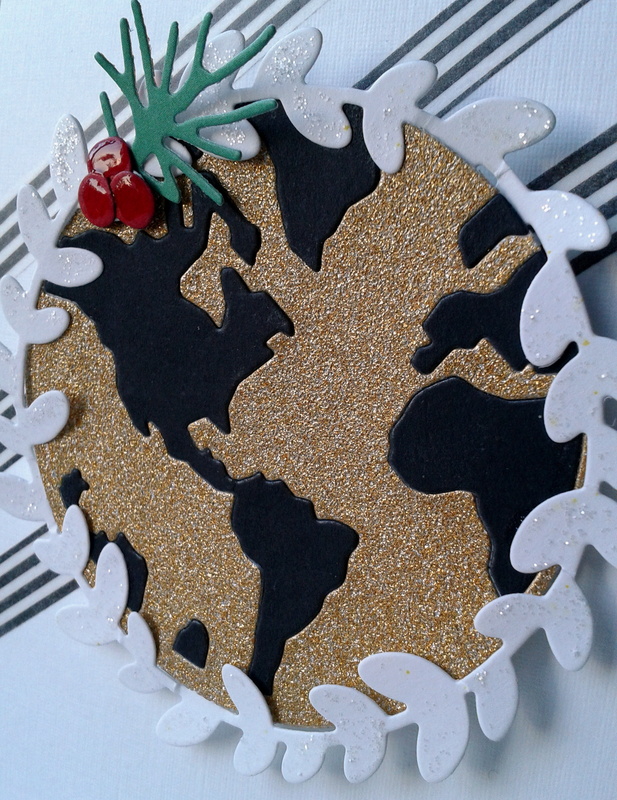 This is also headed over to Virginia’s FINAL challenge–All About Glitter. Virginia’s View challenges have garnered as much interest from our crafting community as the coffee hops. Her challenge is one of the best and her own cards are amazing and always inspiring! We will miss your challenges, but keep following your creative acts! 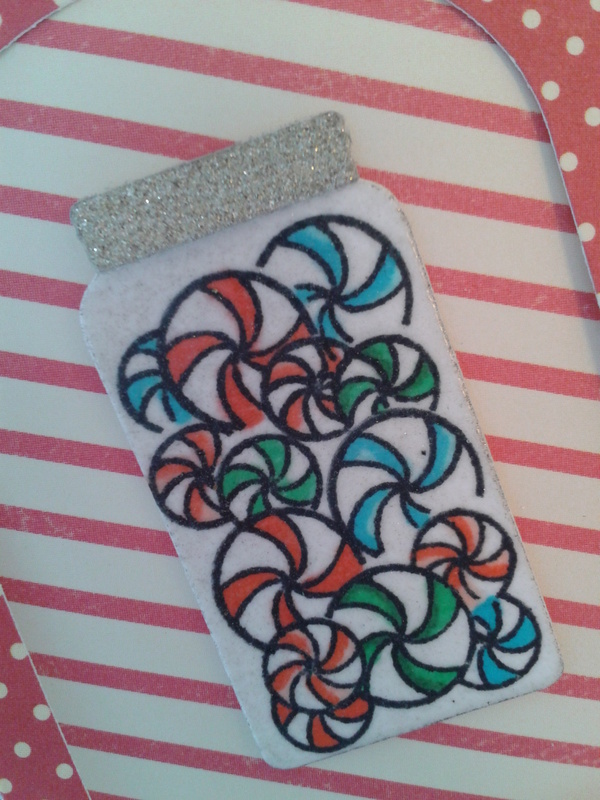 I wish I had my tag completed in time for our crafty gathering and gift exchange. The talented and lovely Katie Brooks took home my gift below! THE GIFTS! So lucky to have a great group of sweet, talented crafters to hang with regularly! What’s on your wish list this holiday? Any crafting must-haves? I saw Santa ordering a MISTI for me! Leave me a comment on your way out and let me know about your Christmas wish, your favorite coffee, or a crazy cat story! 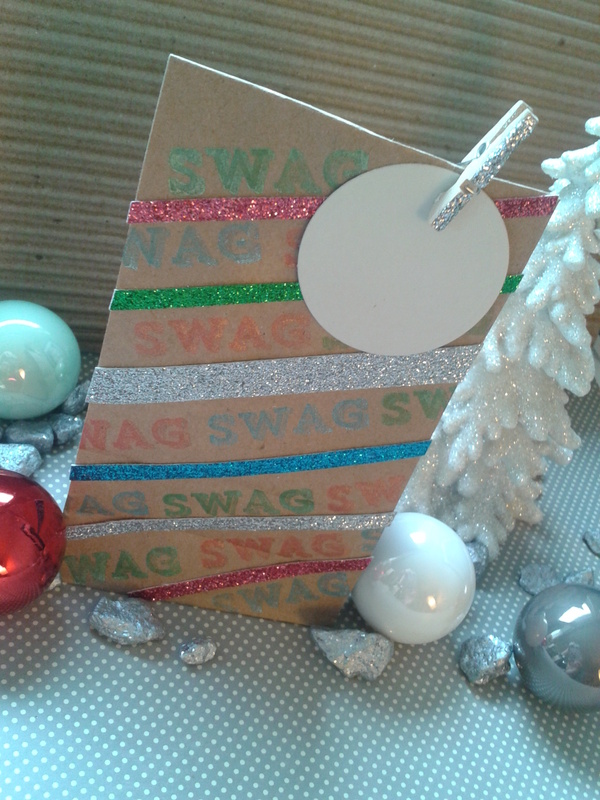 There may be some swag if you do so! Enjoy the hop and have a very merry____________________ and a happy new year! 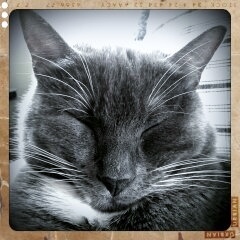 I heard some noise in my studio upstairs, and then movement on the stairs, followed by a thump and a meow. Atticus brings me the most interesting gifts–I think the messages here are “Pay attention to me, not that stupid kitten” and “You should be crafting”! Happy December, all! 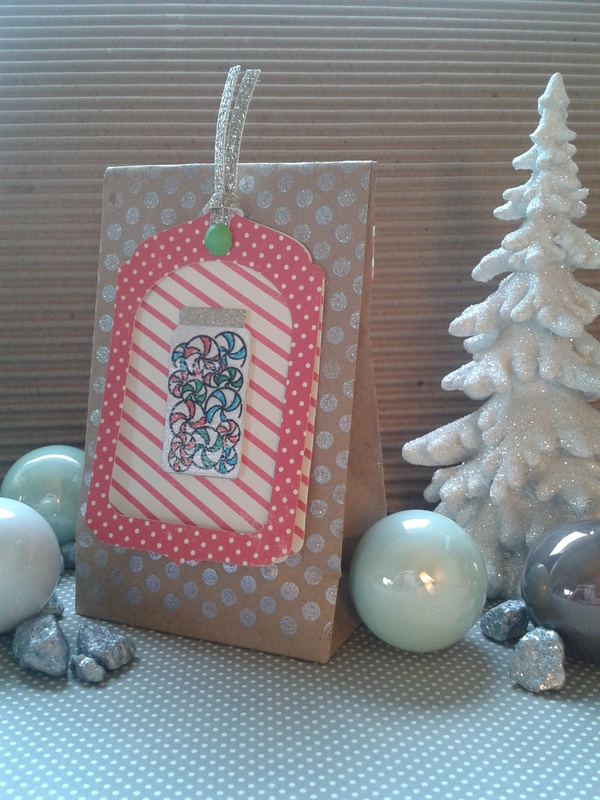 I am excited to share the kraft gift bags I made for the Papertrey Ink challenge this week. 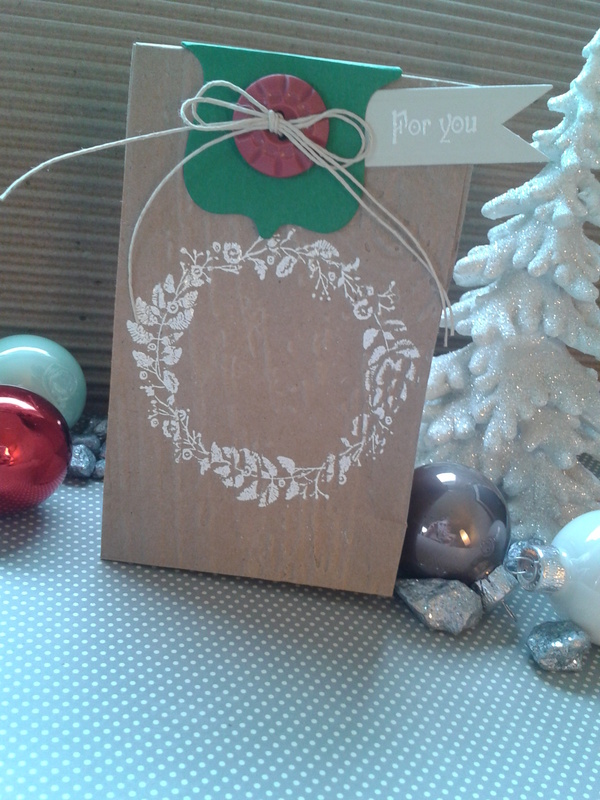 This was a really inspiring challenge as the possibilities are endless and playing around with ideas on little kraft bags is a great way to experiment, since the bags are so inexpensive. Once I got started, I could barely stop! I am going to start with my favorites and explain my process, as I discovered a really cool technique somewhat by accident! 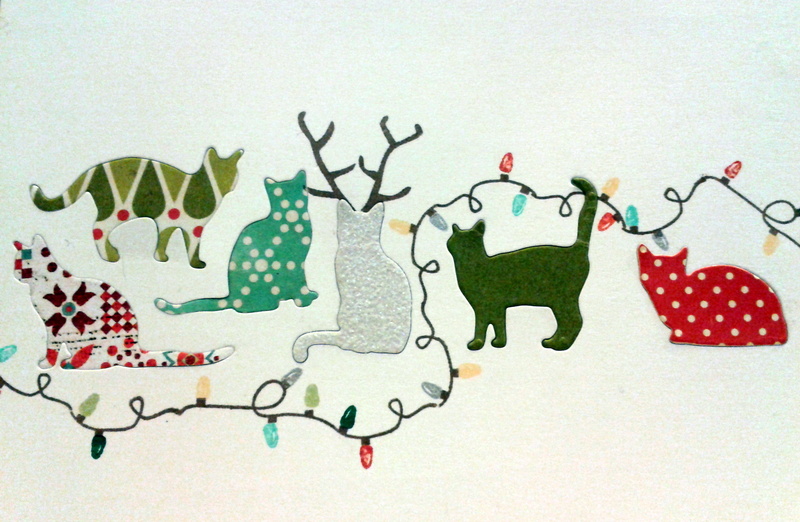 As you can see, I used the light bulbs from Papertrey Ink’s Come All Ye Faithful additions set. I just love these and want to use them all the time! Labor intensive, but worth it! So I first sponged Unicorn White ink onto the Crafter’s Workshop birch trees stencil. Then heat set. Next I stamped all the lights, and heat set again. 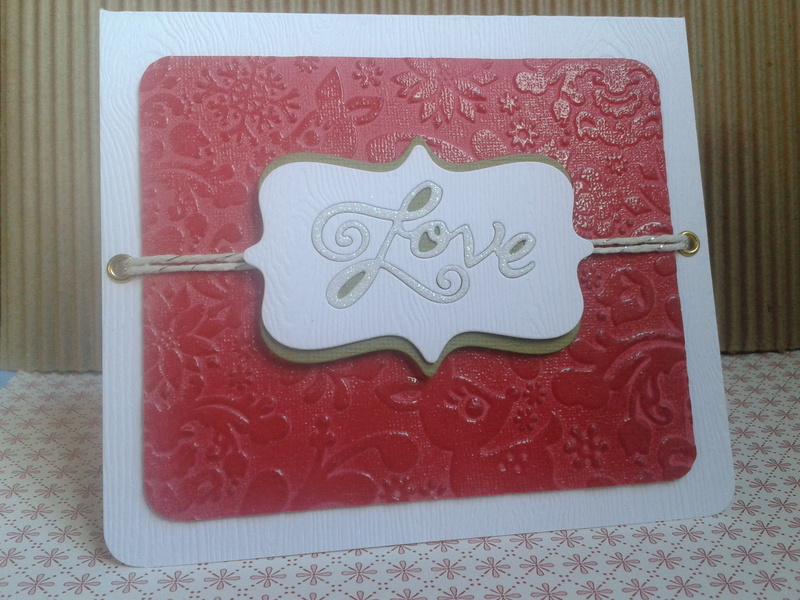 Then I had a bright idea 🙂 I had earlier experimented with stamping Versamark Dazzle directly on my embossing, covered with clear embossing powder and heat set. You can see these cards here. 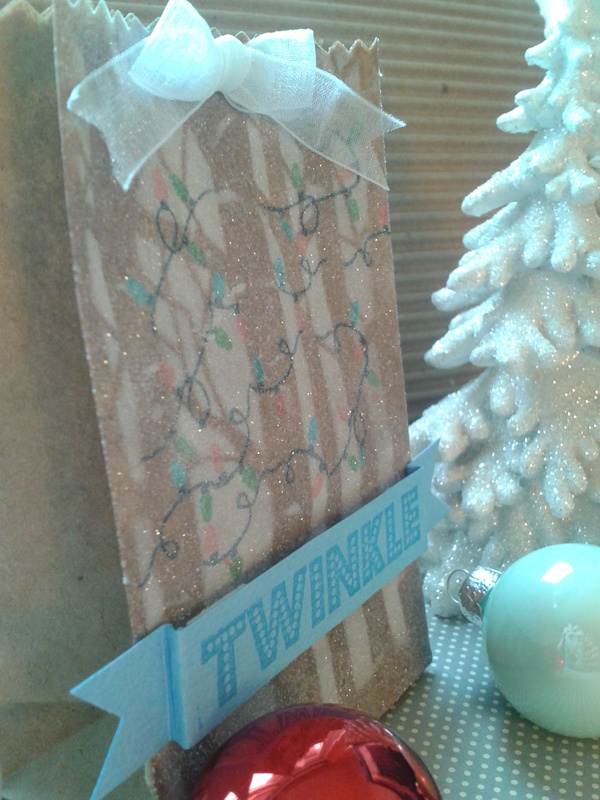 I wanted to create a sparkly winter forest, so I covered the bag with Versamark Dazzle in Champagne; then added Ranger Sticky embossing powder, heat set and sprinkled with white glitter. Ta-da! The effect reminds me of sugar-coated gumdrops and I was thrilled. I will be using this technique on cards and tags this season for sure! I finished it off with a sentiment stamped in blue Brilliance Ink from Amuse Studio’s Hello December set, which I will feature in my next post! 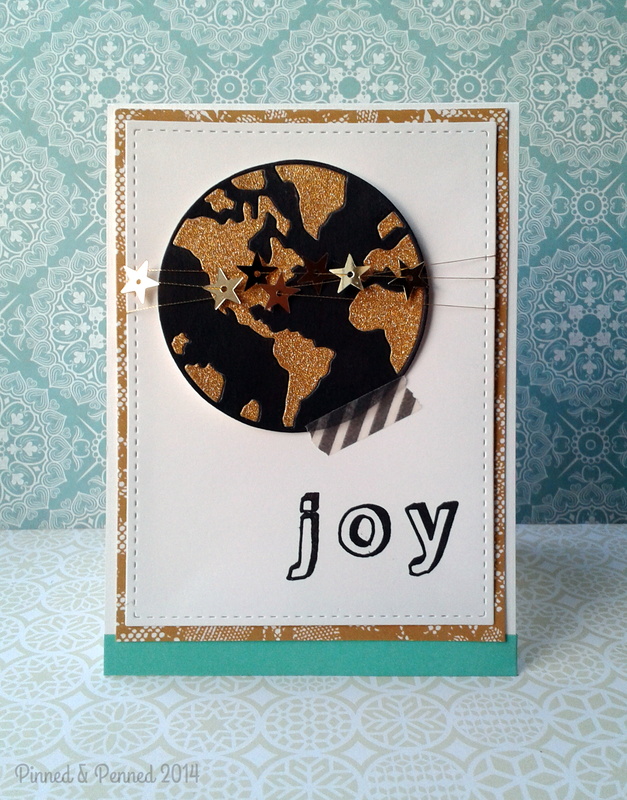 Here I have used Papertrey Ink’s fabulous Tag Sale #8 die as the focal point. 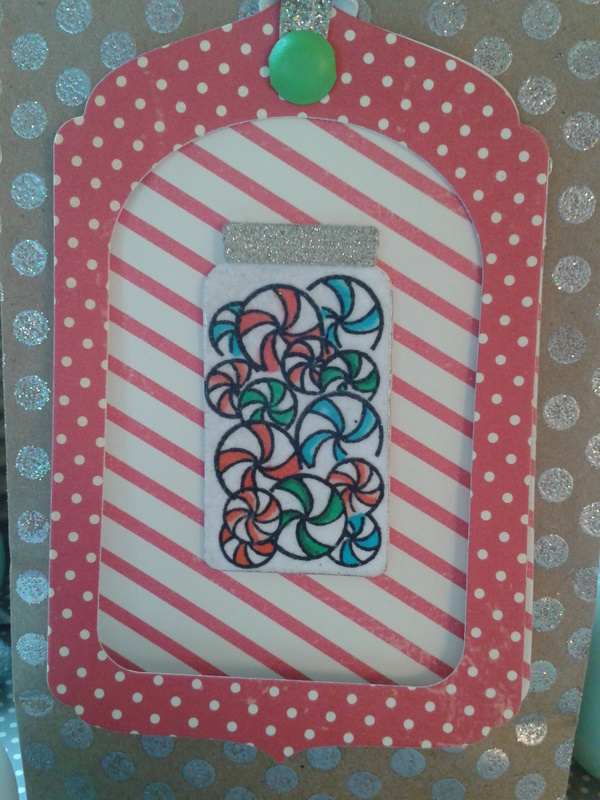 Inside, I have placed my little mason jar from Poppystamps, and filled it with candies from Lawn Fawn’s Sweet Christmas set. The bag’s background was stamped with the Versamark Dazzle and then covered with Bridal embossing powder, which I love and have had forever, from Personal Stamp Exchange. For all the candies, I masked and stamped each one with Tuxedo Black ink so they would overlap. Then I colored with Copics. I heat set and then covered with Versamark Dazzle and clear embossing powder and heat set for a glossy sheen which you can see in the first and last photo. Pretty sweet, don’t you think? This bag was stenciled with Crafter’s Workshop doily in Unicorn White and covered with bridal embossing powder. 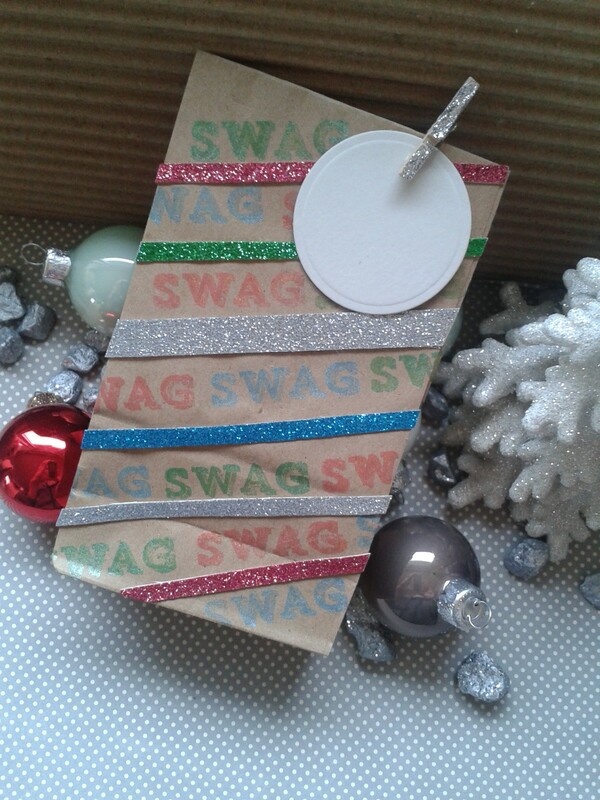 The little button says “sweet” and I thought it was a perfect embellishment for the tag. 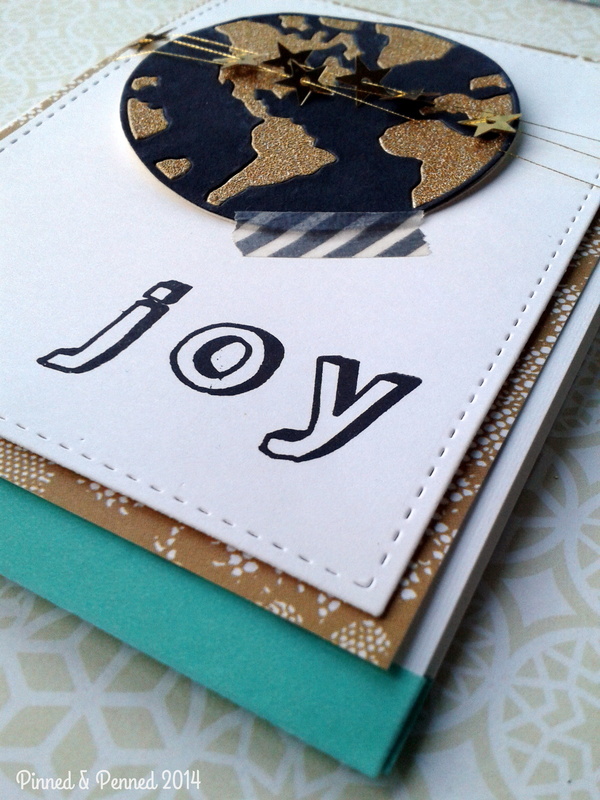 I love Papertrey Ink’s font for the “joy” sentiment, which is from the Mega Mixed Messages set. The green ribbon is covered with doily images that reflect the bag, and instead of using traditional red and white, I opted for juicy, bright pastels. It doesn’t quite represent here, but I used Brilliance Ink in red-gold, which is very iridescent and matches the pink sparkly ribbon. 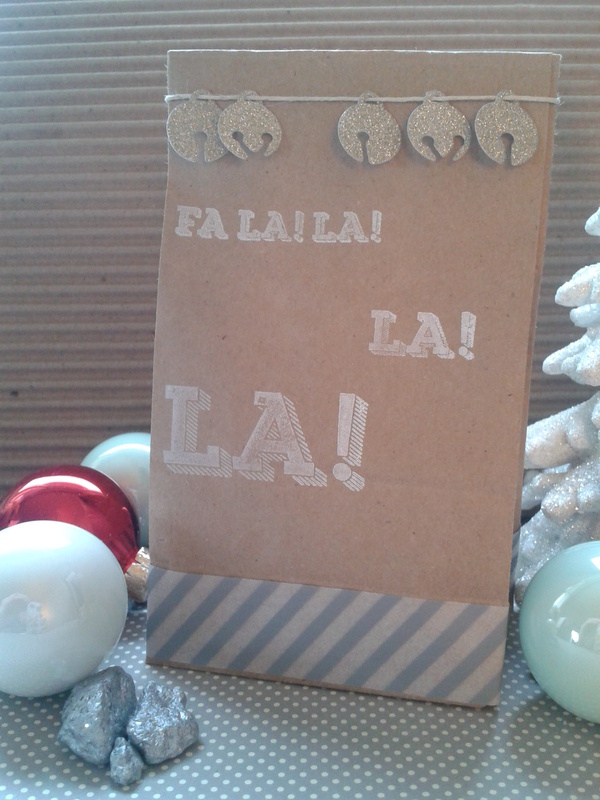 I embossed a few of my kraft bags which really added to the basic brown bag. After embossing, I again covered with Versamark Dazzle, then covered with bridal embossing powder for this shimmery, iridescent quality. 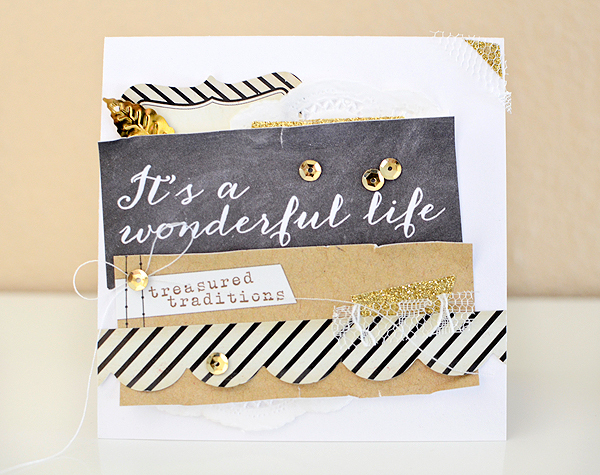 I used Papertrey Ink’s Boutique Borders die and their Joy sentiment again. 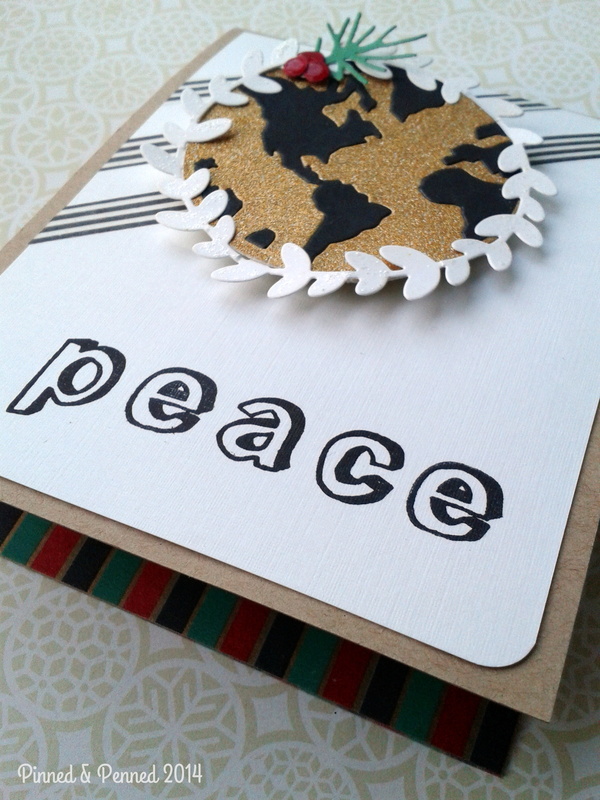 I hand cut some flags from my snowy-white sparkle paper and adhered with silver sparkle brads. 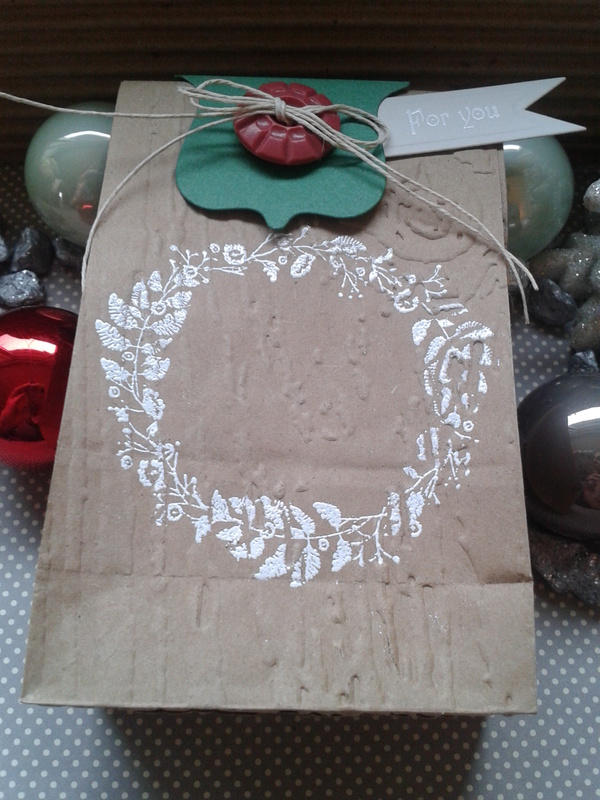 I just LOVE this delicate wreath stamp from Memory Box. It is so versatile and can be used for any season. For this bag, I again embossed it with Tim Holtz’s wood-grain embossing folder. 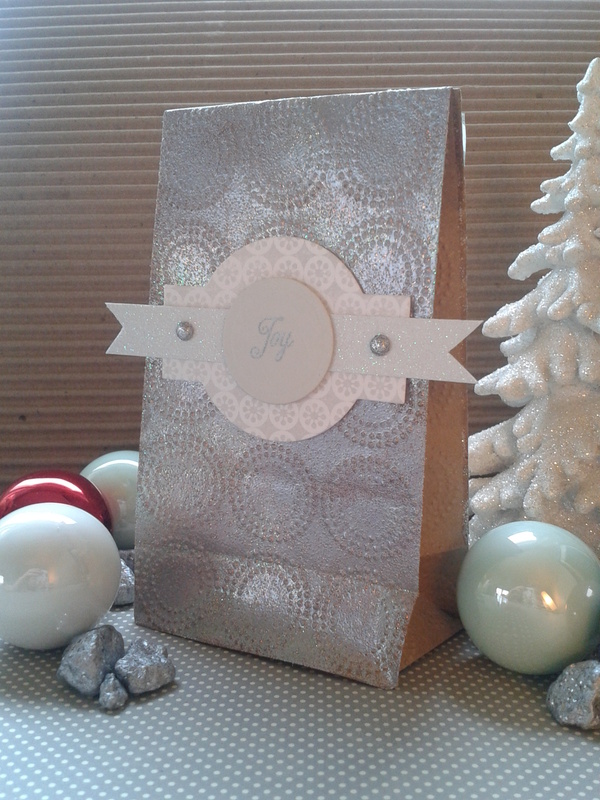 Then I stamped the image with Unicorn White, and embossed with detail white powder from Stampendous. 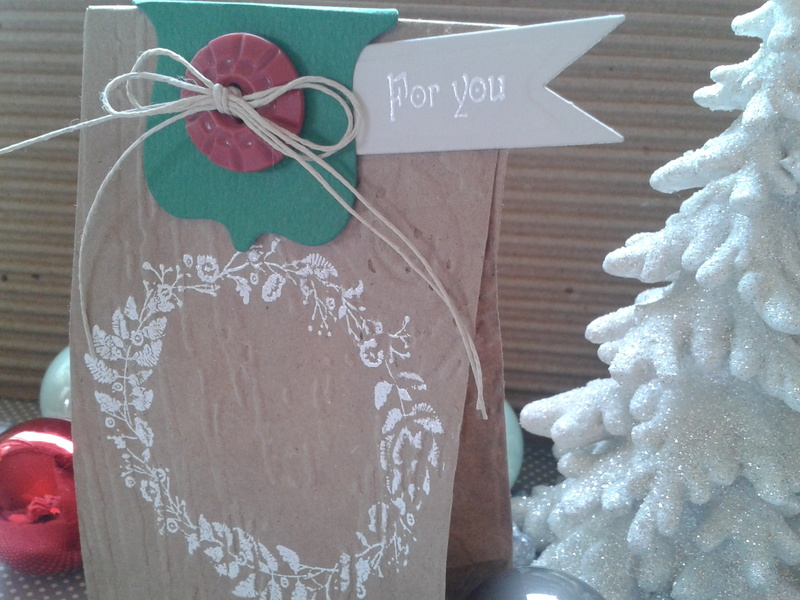 Here you can see the embossing folder detail and glossing effect of the wreath. Instead of using Papertrey Ink’s Fillable Frames #4 die as a label, I folded it and used as a closure! Way to re-purpose! I love seeing products in a new light. The sentiment is from Waltzingmouse Stamps Halloween Party set. Whew! Are you ready for just 2 more? Okay, here they are! 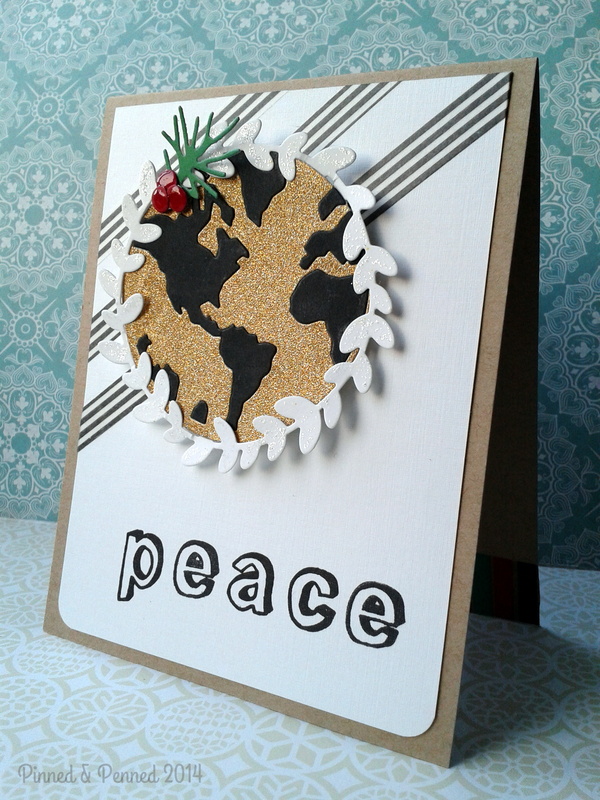 Here I featured Papertrey Ink’s Come All Ye Faithful Additions Set and keeping with the musical theme, added some die-cut silver bells from Memory Box. 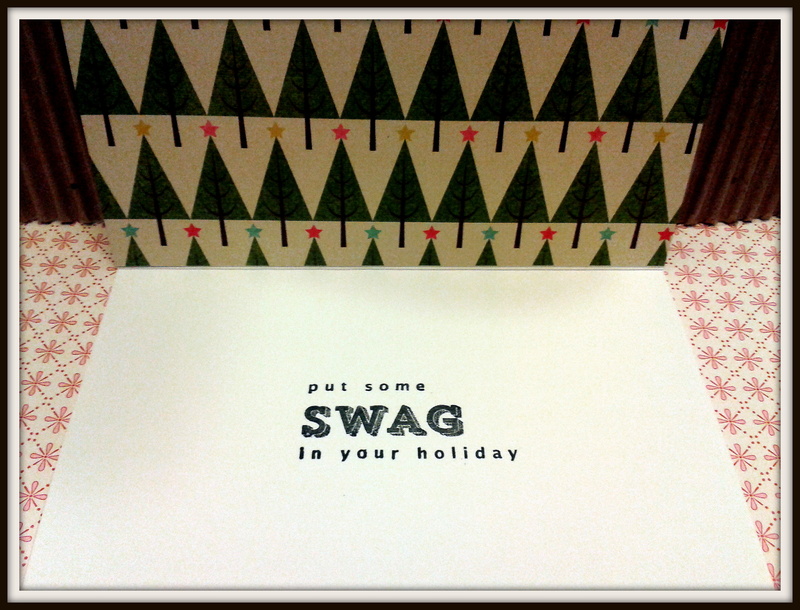 Last, but not, least (though it is my least favorite of the bunch), is my sweet swag bag, featuring Paper Trey Ink’s Come All Ye Faithful Additions sentiment. I used the Memento Brilliance inks for iridescent shine. Ribbons are from American Crafts. 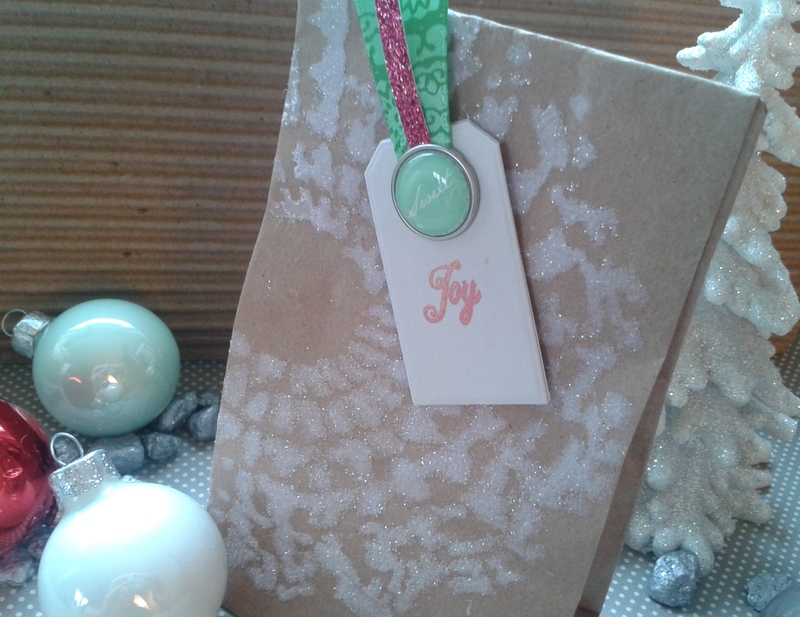 The circle tag can hold a sentiment or someone’s name. So I am more than half-way there for 12 days of Christmas treats! Thanks so much for stopping by–I hope my creations sweetened your day! Comment or email if you would like to know more about my techniques. I love hearing from you and connecting! Now I think it’s time for a few sweets myself–Almond Roca, anyone? 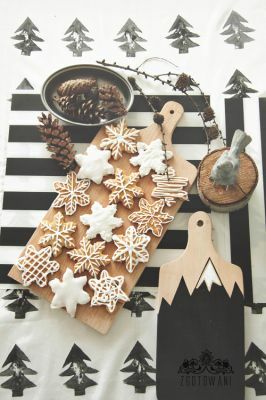 While you are indulging, head over to Nichole’s blog for some serious eye-candy! 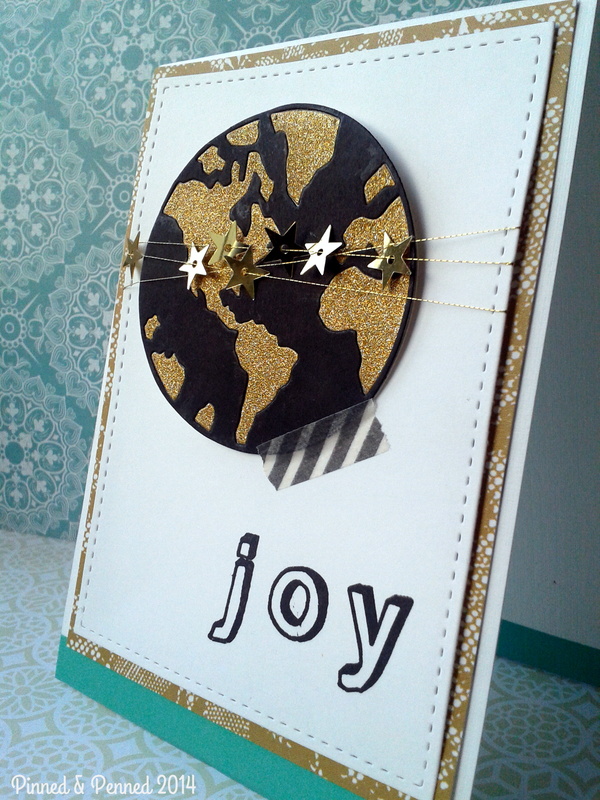 Here’s my last installment for the Papertrey Ink Make It Monday Challenge! 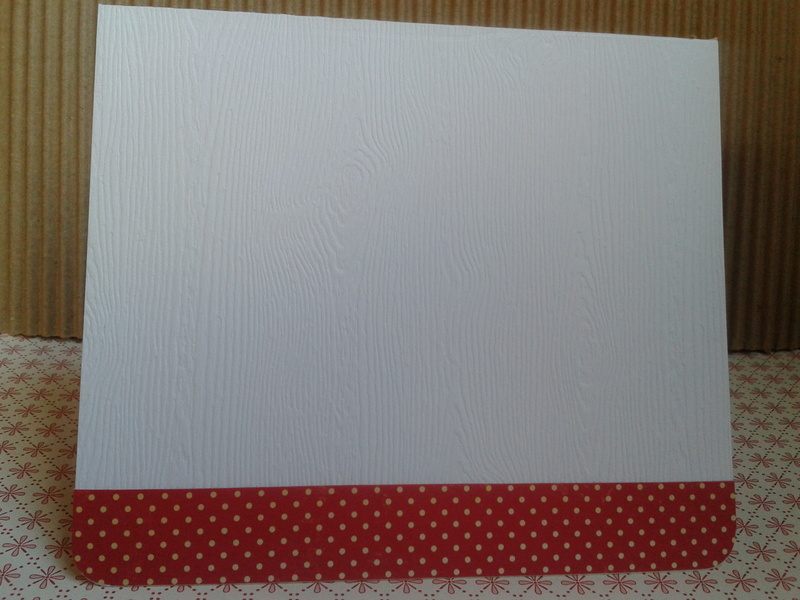 This darling embossed background is the second folder from the Sizzix snowflake set, covered with VersaMark Dazzle and clear embossing power, then heat set. Look at those little deer! I adhered it to Ellen Hutson’s Essentials by Ellen Woodgrain cardstock. 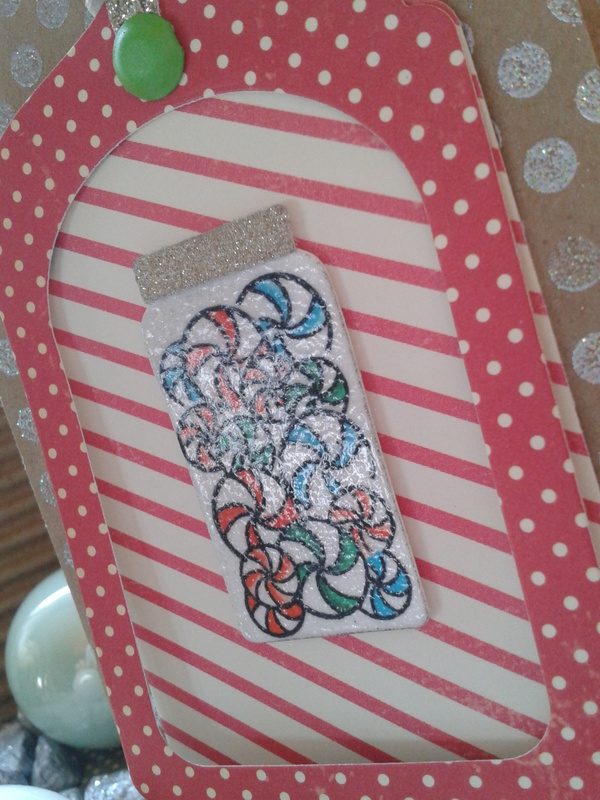 The sparkly inlaid sentiment is from Savvy dies, which I adhered to the Papertrey Ink’s Fillable Frames Die #4. I then cut two more of the frames from pine tree colored paper to shadow the main one. This has to be one of my favorite combination of dies and stamps EVER!!! I am so excited to share this with everyone. I knew when I saw those strings and little lights at Papertrey Ink, I HAD to have the Come All Ye Faithful Additions set! What started as a fairly simple vision became somewhat labor intensive in terms of stamping; it also took a bit of time to decide what papers I would use for the inlaid cats. Look at these little precious fellows from Impression Obsession! The little chicken-sitting one on the right reminds me of my Leo! I used all Colorbox inks for the lights and Memento Cocoa for the antlers and strings. 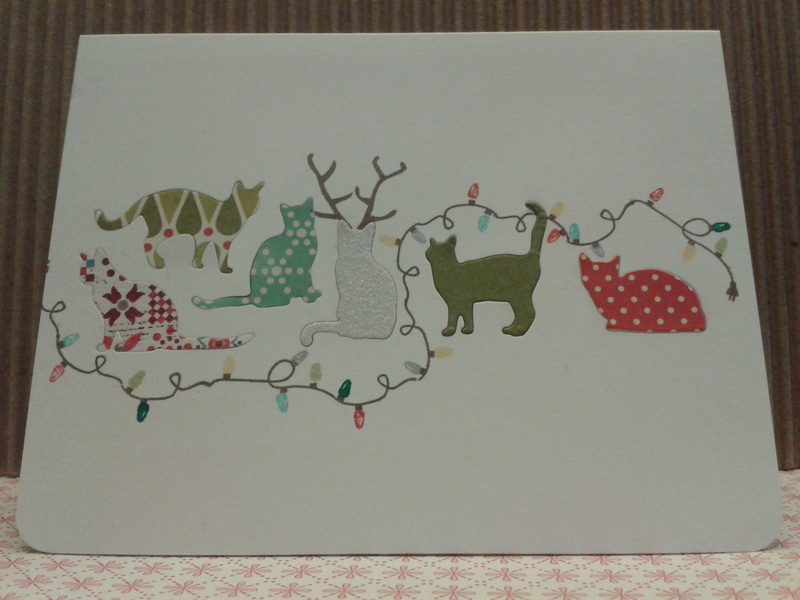 When I finished the card, I thought about embellishing the bottom or adding a sentiment under the cats, but it was one of those cards that just seemed perfect as is was. I hadn’t visualized it with so much white space, but it’s exactly what it needed to put the focus on the colors and shapes. 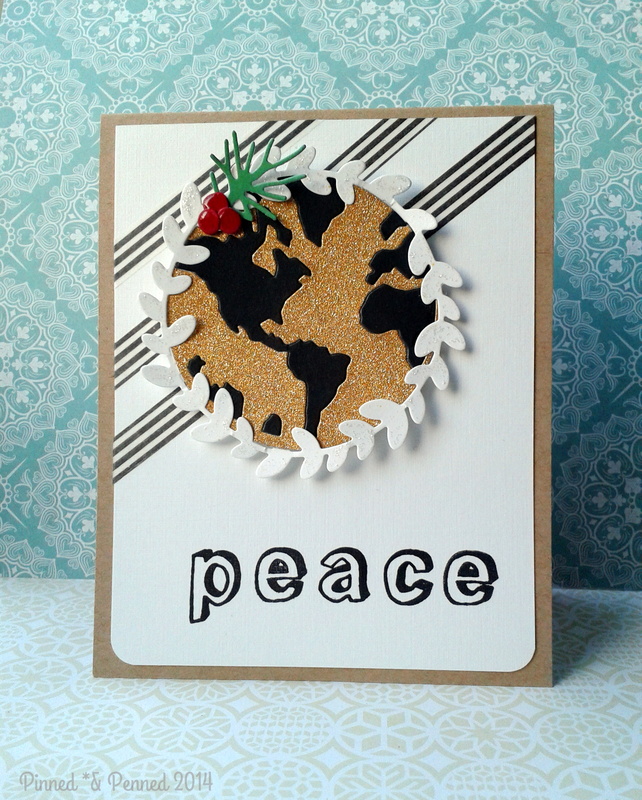 Here’s the cheeky sentiment also from Papertrey Ink! 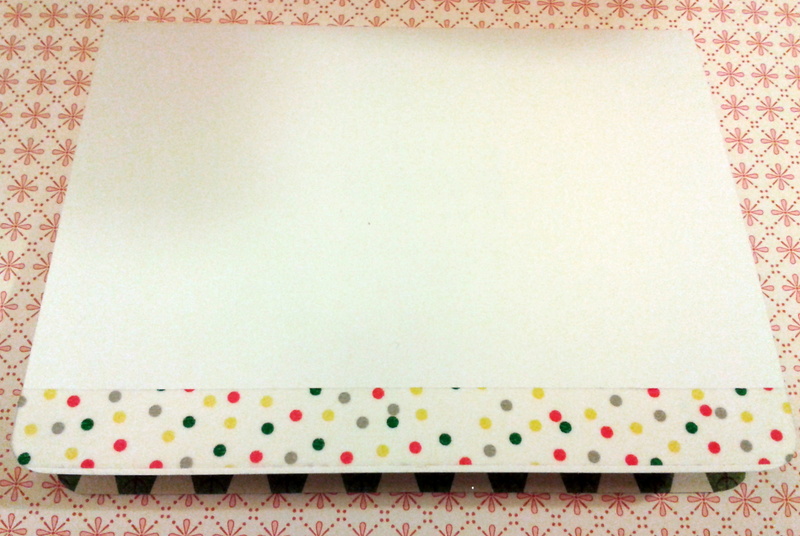 Instead of adding the embellishment to the front, I put fun paper on the inside. Now get over to Capture the Moment blog at Papertrey Ink for some serious swag!